Although pigs are capable of eating whole grains, they cannot digest them. The grain kernels will end up passing through their systems whole unless you first increase the surface area of the grains by grinding them. This allows better interaction with the pig's digestive enzymes and will ensure that your pig receives the nutrition he needs. Grind your pig's feed grains to a particle size of at least 700 to 800 microns to achieve the best efficiency. You may use a hammermill or a roller mill to reduce the particle size of your feed grains. Hammermills, also known as cereal mills, break up grains by repeatedly beating them with a rotating hammer. Roller mills crush grains between two stone or metal wheels rolling in opposite directions. While roller mills offer more grain size stability and require less energy to grind grains, hammermills are less expensive to purchase, have more horsepower, are capable of producing a greater range of particle sizes and are easier to maintain. Whichever type of mill you choose, it is important to check the screens, hammers, or rollers for wear at least monthly and have them repaired or replaced if they are damaged. If you grind with a hammermill, you will need to carefully select the proper size of screen to ensure the correct size of the ground particles. Cover the mill discharge with a screen that has 3/16-inch openings in order to process corn or wheat into 700- to 800-micron particles. For barley, oats or milo, you may use a screen that has eighth-inch spacing to achieve the desired texture. Use a faster shaft speed to shred the grain husk and create a finer grain size. Use a slower speed to avoid husk disintegration and increase the size of the grind. Be careful not to over-process your grains -- A too-fast shaft speed can turn much of your grain to powder. A shaft speed of 150 to 250 rpm, or two to four turns per second, will release the sugars and nutrients within the grains without over-processing them. Pour the grains you have purchased for your pig into the hopper above your mill, taking care not to overfill the container. Adding too many grains to the hopper at once can cause the mill mechanism to jam, which can force time-consuming or costly repairs. 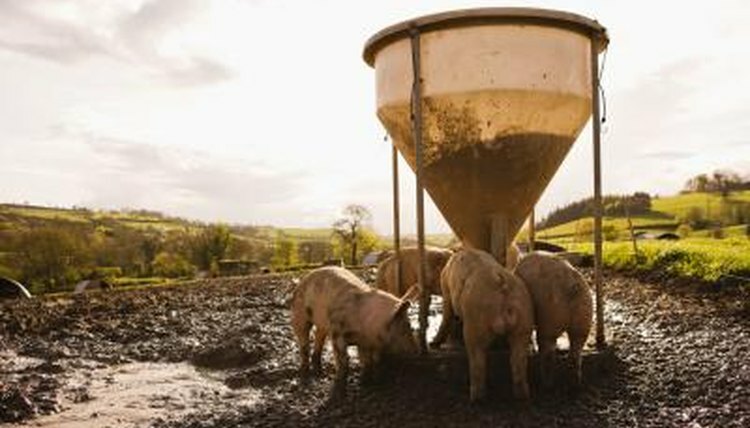 When you turn the crank, or press the button if your mill is electric-powered, steadily poured grains will sift through the grinding mechanism and become nutritious feed for your pigs. Hammermills: How Does a Hammermill Work?